Syproxen is used in musculoskeletal and joint disorders such as ankylosing spondylitis,osteoarthritis and rheumatoid arthritis including juvenile idiopathic arthritis.It is also used in dysmenorrhoea, headache including migraine, postoperative pain soft-tissue disorders, acute gout, and to reduce fever. 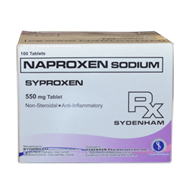 Naproxen is usually given by mouth as the free acid or as the sodium salt. 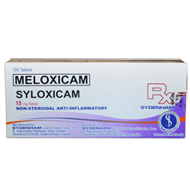 Syloxicam is a Nonsteroidal Anti-inflammatory drug (NSAID) used in the management of rheumatoid arthritis, for the short-term symptomatic treatment of acute exacerbations of osteoarthritis, and for the symptomatic treatment of ankylosing spondylitis. 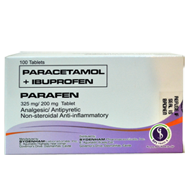 Parafen is used for the relief of mild to moderate pain and inflammation in dysmenorrhea, headache, postoperative pain, dental pain, musculoskeletal and joint disorders, and for the reduction of fever.